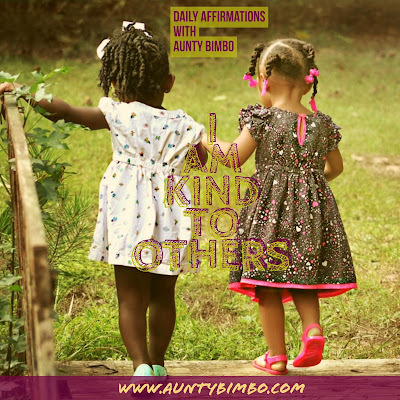 Week 2: Family Affirmation Study; Is Your Child Kind To Others? How Can A Child Be Kind? Teaching a child to be kind is a virtue that helps that child show concern about other people. Your child needs to understand that being kind means they consider another person’s feelings and not just their own. Kindness means to help other people without expecting anything in return and it is never too early to help guide children into recognizing other people's feelings. As a parent, you can start teaching your child about kindness through playtime with their siblings or friends. An example is for the child to be concerned when their friend or sibling is either crying or sad. They should learn to ask what is wrong and say sorry. However the best way to teach your child to be kind is by example which means practicing what you preach. Be the example you want to see in your child. For example,If you speak kindly about others your child will copy this and vice versa. Your child will learn a great deal about kindness from your behavior, so it is important to model what you want your child to copy by showing kind actions and behavior. Let kindness show in your daily words and deeds and through this you can teach your child to be nice and kind to others. Once your child understands what it means to be kind, saying this affirmation, I AM KIND TO OTHERS, will not just be lip service but will be backed by actions of kindness to people both within and outside their family. Help your child realise that being kind is an important quality to have and that it can be portrayed via the characteristics of being friendly, generous, and considerate. They also need to understand that you don’t need to have a reason for being kind rather, it’s something you do simply because it’s the right way to treat others. Being kind will also allow your child communicate better, be more compassionate, and also be a positive force in people's lives. Will you help your child be kind to others today?